Watch the Entire Ferris Bueller Super Bowl Commercial!!! Well, last week, we posted a strange video that popped up that was a 10 second commercial that featured Matthew Broderick as Ferris Bueller once again. And the end title was the date for the Super Bowl. Soon after we posted the video, we got word that it was a promo spot for the new Honda CR-V. The promo will be featured on Super Bowl Sunday. While this is not the coolest news ever, it certainly is a great move in the marketing department for Honda. I wonder if any other promo spots will feature other films? Can you imagine a Breakfast Club commercial? I was disappointed to not see any of the other actors in this commercial, but a lot of the key scenes are in the commercial. It’s about two minutes long, and I’m sure everyone will get a kick out of it. Enjoy. Yet Another Star Wars/Dog/Volkswagen Super Bowl Commercial!!! 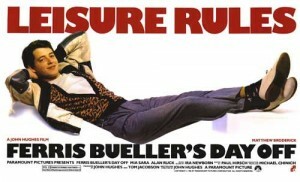 Is Ferris Bueller Coming Back for the Super Bowl??? Did you See That ‘Under the Dome’ Promo?? This entry was posted on Monday, January 30th, 2012 at 1:12 pm	and is filed under News, Television. You can follow any responses to this entry through the RSS 2.0 feed. You can skip to the end and leave a response. Pinging is currently not allowed. If I was to watch this during the Super Bowl, I would probably have been talking about how much I enjoyed it. But seeing it on YouTube, in the context it was presented in, I get really frustrated. It’s really just crappy manipulation because it’s trading off of nostalgia from a movie that we all enjoyed some time ago, and associating it with a stupid car. Broderick or Ferris have nothing to do with a Honda. It could be argued that “Ferris Bueller’s Day Off” was about teen angst and rebellion. This is the opposite of that. This commercial is about buying in and consumerism and conformity, while still trading of the emotional capital of the exact opposite. And that it why it is lame. that may be, but any new ferris bueller with Broderick is good enough for me. « Learn What Happens on the Third Season of ‘Eastbound and Down’!! !